Leland King, who abruptly left the Brown basketball program in January as the team’s leading scorer, announced on Twitter this weekend that he is transferring to Nevada, where he will be eligible to play two seasons after sitting out the 2015-16 campaign. The 6-foot-7, 220-pound King is in abundant company, as Nevada has welcomed Southern Illinois forward Jordan Caroline, Missouri State guard Marcus Marshall and Marshall guard Shawn Smith as transfers this offseason as well. King was having the breakout season he was expected to have before walking away in 2014-15, posting 14.6 points and 7.8 rebounds per contest. He functions best as a pure scorer who can penetrate and should have space to do so with several other talented Nevada transfers, including Marshall, who had been averaging 19.5 points per game last season before leaving the Missouri State program. Because of all the transfers that will comprise the Wolfpack in the future, it’s hard to figure exactly how King will run with the Pack in Reno, but Nevada could use his help, having gone just 9-22 last season. UPDATE: As the great rb noted in the comment section, King told the Reno Gazette-Journal about leaving Brown for Nevada: “I was just looking for something different. I don’t feel I fit in there and I wanted to play in a bigger league. I was looking for a place that takes basketball a little more seriously.” Well, at least he was honest, and he was also accurate in identifying his “scoring ability” as his biggest strength. It’s been an awfully busy offseason for transfers throughout the Ivy League. Shonn Miller is off to Storrs. Rafael Maia is pining for Pittsburgh, Alex Mitola is set for D.C. and Denton Koon is headed to Hempstead. But which Ivy transfer is going to have the biggest impact on their team in 2015-16? This time, it’s Brown senior forward Rafael Maia, who now joins Pittsburgh as a graduate transfer for the 2015-16 season. In his final campaign for the Bears in 2014-15, the Sao Paulo, Brazil native led the Ivy League in rebounding and field-goal percentage while providing the Bears one of the best post presences in the entire league. The Pittsburgh Post-Gazette reports that Maia chose Pitt over Nebraska and USC, and that Maia is the second graduate transfer addition for the Panthers this offseason. Like Shonn Miller, Alex Mitola and Denton Koon upon their graduate transfers, Maia is immediately eligible. Maia seemed to pick up his game in league play after then-leading scorer Leland King left the team just two contests into the conference slate, shaking off a December slump in which he scored just 13 points in a four-game stretch. Maia takes smart shots and can post up with the best of them, as he showed with solid efforts against Northwestern and Illinois in nonconference play. Athletic director Jack Hayes announced Wednesday that Brown, which has easily totaled the lowest amount of basketball expenses among all Ivies since 2004 according to Office of Postsecondary Education statistics, will transfer the remaining monies in its basketball budget to the budget for its men’s hockey team. The basketball team will raise funds going forward by pooling together lunch money taken from the players by coach Mike Martin. Brown Athletics announced today that the team’s leading scorer, sophomore forward Leland King, has decided to leave the program for personal reasons. 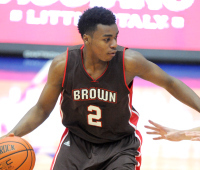 The news is very unexpected with Brown just two games into Ivy League play (both losses, making Brown the only Ivy with two losses thus far). And now that King is gone, so are his 14.6 points and 7.8 rebounds per game, a huge blow for a team that has already struggled on both offense (worst assist-turnover ratio in the conference) and defense (worst scoring defense in the conference) this season. 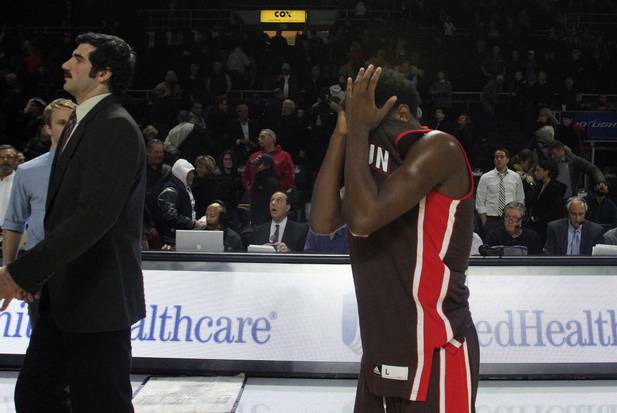 King had missed Brown’s last two road games, including the Bears’ 69-65 loss at Yale Saturday, a game in which senior forward Rafael Maia and sophomore guards Steven Spieth and Tavon Blackmon combined for 50 points, 18 rebounds and nine assists in King’s absence. Senior guard Zeve Sanderson left the team earlier this team as well, and highly touted freshmen Aram Martin and Matty Madigan also left the program after their freshman campaigns in 2013-14. Why is Brown basketball down? So what’s up with Brown? The Bears have always been a solid defensive unit under coach Mike Martin. They boast a frontcourt that features two-time Ivy Defensive Player of the Year Cedric Kuakumensah and fellow defensive stalwart Rafa Maia. Sophomore guard Steven Spieth also came into this season with a bit of a reputation as a strong backcourt defender as well. And yet the Bears also have what is comfortably the worst defense in the conference statistically at this early stage of the season. They can’t defend in transition at all. Brown is who we thought they were! At least so far. The Bears’ season-opening 70-58 win over St. Peter’s confirms preseason impressions of Brown – this team can really play defense. Brown held the Peacocks to just 36.1 shooting from the field and two-time reigning Ivy Defensive Player of the Year Cedric Kuakumensah registered three more blocks along with an impressive 15-point performance marked by surprisingly effective perimeter shooting on occasion. Rafa Maia notched seven rebounds as well to go along with 13 points. Most importantly, Tavon Blackmon controlled the pace of the game from the point for Brown, posting 18 points on 4-for-7 shooting, once again proving a legitimate threat from beyond the arc and especially the charity stripe, where he drilled all eight of his free throws. Blackmon is just a steady player who gets it done, and the Bears’ season is off to a solid start. I maintain the Bears are poised to surprise this season. I’m bullish on the Bears. Yes, All-Everything Sean McGonagill is gone, and so is his ball distribution, three-point shooting, offensive potency from anywhere on the court and, well, everything! But the Bears will be better than last year because they’ll be more well-rounded in 2014-15 from inside out, the single-most underrated team in the Ivy League.